Though more of a contemporary movie than a historical one, nevertheless, John Ford’s 1940 adaptation of John Steinbeck’s The Grapes of Wrath has become the definitive film about the Great Depression. 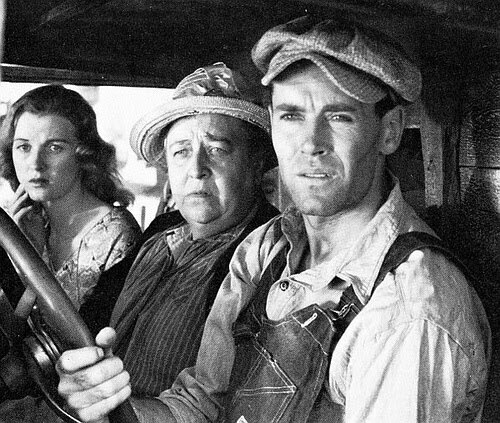 It’s also famous for making Henry Fonda a star in his iconic role as ex-convict Tom Joad. It’s a saga about the Joad family who are forced off their farm in Oklahoma and become migrant workers in California. The Joads’ bleak economic condition and displacement leads to the disintegration of their family as well as puts them in worse shape than ever before. Yet, this movie demonstrates the strength of the idea of community in the face of hard times held by women like Ma Joad who endure just about any obstacle that might hit them. Unfortunately the bad economic practices of the 1920s soon caught up with everyone that by the 1930s much of the world was engulfed in the greatest economic crisis in history. It began with the Wall Street Crash of 1929 with its effects lasting for over a decade. Banks failed, businesses closed, jobs were lost, homes were foreclosed, fortunes were lost overnight, and so on. Millions of people had lost everything and struggled to make enough to survive. In Europe, while the Depression wasn’t as bad as it may seem in the United States, but some countries were dominated by totalitarianism like Nazi Germany and many of these ruthless dictators had a following of fans outside their borders. And later in the decade, Europe would become engulfed in power struggles that would eventually lead to all out violence in conflicts like the Spanish Civil War as well as World War II. This isn’t seen as a happy time in movies and no wonder yet sometimes films seem rather optimistic of what was going to happen compared to what was yet to come. In the United States, the Great Depression is a period known for its widespread poverty, mass unemployment, folk singing hobos, and the Dust Bowl. During this time, a third of the nation went to bed hungry. Radical politics was common place with an intensity and popularity perhaps unprecedented in American history. Yet, this is also the decade of the New Deal which was instituted by Franklin Delano Roosevelt with programs like Social Security, public works projects, banking reforms, labor relations, labor standards, and others. While it’s still debated whether the New Deal programs had any effect in the positive sense, what can’t be denied is that many of these programs are still around which have been credited for preventing another horrible economic catastrophe from happening since and for overseeing a relatively stable economy most of the time. But in the 1930s, you also have the beginnings of the Golden Age of Hollywood with musicals, screwball comedies, gangster films, and other masterpieces. Still, while movies set in this time get some things about the Great Depression right, there are plenty they get wrong, which I shall list. “I have been walking onto ball fields for sixteen years, and I’ve never received anything but kindness and encouragement from you fans. I have had the great honor to have played with these great veteran ballplayers on my left – Murderers’ Row, our championship team of 1927. I have had the further honor of living with and playing with these men on my right – the Bronx Bombers, the Yankees of today. “I have been given fame and undeserved praise by the boys up there behind the wire in the press box, my friends, the sportswriters. I have worked under the two greatest managers of all time, Miller Huggins and Joe McCarthy. “I have a mother and father who fought to give me health and a solid background in my youth. I have a wife, a companion for life, who has shown me more courage than I ever knew. “Fans, for the past two weeks you have been reading about a bad break. Yet today I consider myself the luckiest man on the face of the Earth. I have been in ballparks for seventeen years and have never received anything but kindness and encouragement from you fans. “When the New York Giants, a team you would give your right arm to beat, and vice versa, sends you a gift – that’s something. When everybody down to the groundskeepers and those boys in white coats remember you with trophies — that’s something. When you have a wonderful mother-in-law who takes sides with you in squabbles with her own daughter — that’s something. When you have a father and a mother who work all their lives so you can have an education and build your body — it’s a blessing. When you have a wife who has been a tower of strength and shown more courage than you dreamed existed – that’s the finest I know. Hoboes were just harmless old drifters full of tall tales and song just wanting to see the world. Hobos always carried their belongings in bindle sticks. This entry was posted in Movies and tagged history, Humor, United States, WTF?. Bookmark the permalink.